Today’s dental practices need environmental infection prevention strategies that can address a range of threats, from bloodborne pathogens like viral hepatitis to multi-drug resistant organisms such as methicillin-resistant Staphylococcus aureus (MRSA) and Carbapenem-resistant Enterobacteriaceae (CRE), to seasonal challenges like influenza virus, norovirus, and the bacteria and viruses that cause the common cold, all of which may contaminate environmental surfaces in dental practices. Surface contamination is not only an issue in the operatory. Compliant cleaning and disinfection of surfaces is important throughout the dental practice, including in the reception and waiting-room areas. In a recent study published in the Journal of Dental Hygiene, surface sampling from dental practices in Arizona and Missouri isolated bacteria from environmental surfaces inside and outside patient care areas.2 In another study, researchers recovered MRSA colonies from light switches, computer keyboards, and dental chair push-buttons in the span of a single day.3 Researchers have found that other germ hotspots within reception and waiting-room areas include office door knobs, office phones, and countertops. For dental practices, Clorox Healthcare recommends selecting healthcare surface disinfectants with EPA-registered disinfecting claims against MRSA, influenza viruses, and bloodborne pathogens. To protect patients and staff from the transmission of bloodborne pathogens, we also recommend that dental providers refer to the Centers for Disease Control and Prevention (CDC) guidelines for infection prevention and control in dental settings and the Occupational Safety and Health Administration (OSHA) Bloodborne Pathogens guidelines. It is additionally important to ensure that environmental infection prevention measures can be implemented without damaging the surfaces and equipment on which they are used. 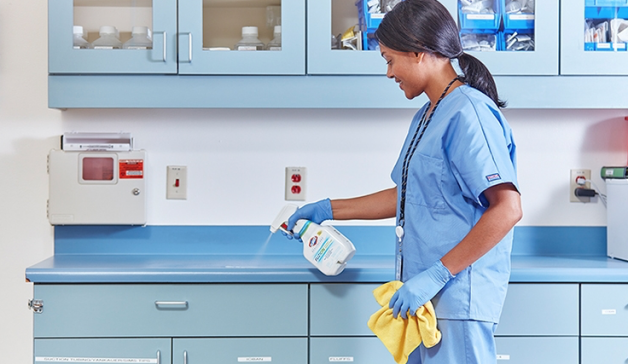 Newer products such as Clorox Healthcare Fuzion Cleaner Disinfectant are optimized for broad surface compatibility, eliminating the need to make tradeoffs between efficacy and surface compatibility. By selecting surface disinfectants that are compatible with a broad range of surfaces found within dental settings, such as plastics and stainless steel, dental practices can maximize product use and prevent surface damage. This not only helps dental practices standardize their cleaning and disinfecting protocols, but also helps them protect their bottom lines by eliminating the need for multiple products and the risk of damage that can result in the replacement of equipment. First, to evaluate surface compatibility, dental teams should review the labels on their disinfectants to ensure that they are compatible with the surfaces in the practice. Next, they should refer to equipment cleaning and care guides to ensure that the disinfectant solution meets the recommendations from the manufacturer. When in doubt, dental providers should reach out to the disinfectant manufacturer with technical questions. Some manufacturers have technical services teams that can help address questions about surface compatibility. Dental equipment manufacturers can also submit their equipment for testing with Clorox Healthcare products to ensure their compatibility through the Clorox Healthcare Compatible Program, making it easier for dental practices to know what products are safe to use on which surfaces. • As a team, review important infection prevention guidelines and OSHA regulations that pertain to your practice. Online training is available through sites like Viva Learning, which offers free continuing education courses in infection control best practices. • Develop a robust written infection control plan for your practice, with cleaning and disinfecting protocols that include cleaning responsibility grids detailing who cleans which piece of equipment or surface, with which product and how frequently. • Educate all team members including office and reception staff about the important role they play in preventing the spread of infection. Reviewing hand hygiene basics and key surfaces to clean and disinfect is a great way to start. • Compile a list of key resources to leverage when team members have questions. Include CDC recommendations, key regulatory agencies, and manufacturer technical services contact information. Remember, by combining innovative and efficacious surface disinfectants with enhanced staff education and standardized cleaning and disinfection protocols, dental practices can effectively prevent the spread of harmful pathogens and bacteria. Additional resources and information on best practices for infection prevention and control in dental practices are available via the CDC’s Oral Health page and the Organization for Safety, Asepsis and Prevention (OSAP) knowledge center. Kramer A, Schewbke I, Kampf G. How long do nosocomial pathogens persist on inanimate surfaces? A systematic review. BMC Infect Dis. 2006;6:130. Gerba CP, Lopez GU, Ikner LA. Distribution of bacteria in dental offices and the impact of hydrogen peroxide disinfecting wipes. J Dent Hyg. 2016;90:354-361. Motta RH, Groppo FC, Bergamaschi Cde C, et al. Isolation and antimicrobial resistance of Staphylococcus aureus isolates in a dental clinic environment. Infect Control Hosp Epidemiol. 2007;28:185-190. Dr. Bell-West serves as a technical liaison for Clorox Healthcare, where she supports the development and implementation of surface disinfection solutions across the healthcare continuum. She holds a doctorate in chemistry from the University of California, Berkeley, and is an active member of the Association for the Healthcare Environment and Association for Professionals in Infection Control and Epidemiology. She has authored articles in infection control periodicals as well as developed and presented educational sessions for environmental services technicians and infection preventionists on topics including disinfectant selection and ways to improve cleaning and disinfection compliance in healthcare settings. Source: Dentistry Today, story by Sarah Bell West, Ph.D.